Happy New Year! I can't quite believe it's 2015 already. Last year went by in such a blur and, in all honesty, I'm more than happy to be leaving it behind. 2014 was a year of ups and downs, tainted mainly with lows. I won't go into them in detail, but safe to say it was one of the most stressful, upsetting years I've had and one that left me feeling incredibly unhappy with myself. I might touch on things in the future but for now I'll just put it bluntly - 2014 wasn't great for me. Having said that, there are a few positive things to come of 2014, which I really ought to mention. I haven't said this on my blog yet, but 2014 was the year I achieved my dream job of being a journalist, writing for a magazine, and I am absolutely loving it. With a new job came moving out and standing on my own two feet, getting my own house and buying my dream brand new car. Scary, right?! I am incredibly proud of myself for achieving these things, and although 2014 was mainly shrouded with sadness, I do have these positives to hold on to. So, onwards and upwards I say - there's no point dwelling on the past, and 2015, I decided fairly early on last year, is going to be MY year, if it kills me. I want 2015 to be a year of positivity, working hard, getting focused and achieving, but most importantly, being happy. Happiness is my biggest want in life and it's something I struggle keeping hold of, but I'm planning on making 2015 the year I finally get happy. Lose weight : I know, I know, I'm the world's biggest cliche, but losing weight is something I have attempted and given up trying to do so many times before, I'm now realising it's now or never. I have put on a lot of weight over the past year, and I am now setting myself the goal of losing a whopping four stone. I might not look like I need to lose that much, but to be happy in myself (and healthy, of course) I need to do it. I think it's probably going to be the hardest thing I'll ever do, but I'm damned if I don't achieve my goal this year. Improve and overhaul my blog and YouTube : My blog is one of my favourite things in life and it honestly brings me so much happiness. Sometimes, though, I find that my mood or life gets in the way and it means I don't blog as much as I'd like to. I look at other bloggers who have been doing this for half the time as me but are so far ahead, and whilst I'm happy for them, and it makes me sad. I want 2015 to be the year I really improve and grow my blog, improve my content and really make a mark on the blogging world. I also want to somewhat 'overhaul' my blog, giving it a much-needed makeover and perhaps even a name change (although I'm not sure on this - advice please!) The same, of course, applies to my YouTube channel. Manage my money : You probably know this from the amount of Primark hauls regularly uploaded on my channel, but I am terrible when it comes to managing my money. I always spend money on things I can't afford, but since getting my own place I've realised I can't keep doing this, and it's time to think about really sorting my money out and making sure I budget properly. I'm reintroducing my 'What did I buy today?' book (which unfortunately has been sitting lifeless over the past year) and focusing on saving instead of spending so much. Get organised & look after myself better : I have a confession to make - I'm not very good at looking after myself. Be it eating properly, keeping my hair in a good condition or keeping my skincare regime up to scratch - I'm a bit rubbish at all of these things. I know that my lack of organisation and care for myself ultimately makes me really unhappy, so it's time to change things. I need to ensure I am organised in all aspects of my life, and make sure I give myself a proper routine. There are many more things I could add, including reading more books, writing more (including properly writing a book, something I have wanted to do for so long), experiencing new things more and being more active, but I'd literally be here all year, so I'm going to leave it there. 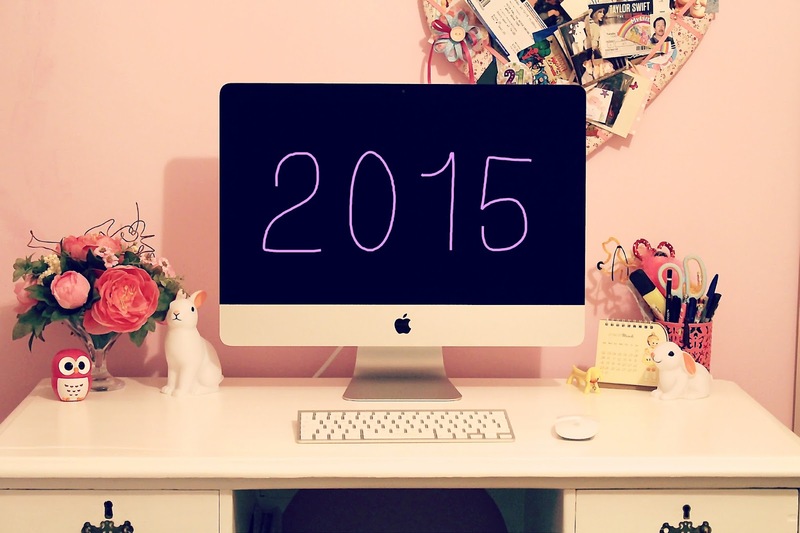 What are your hopes for 2015? I'd love to hear!